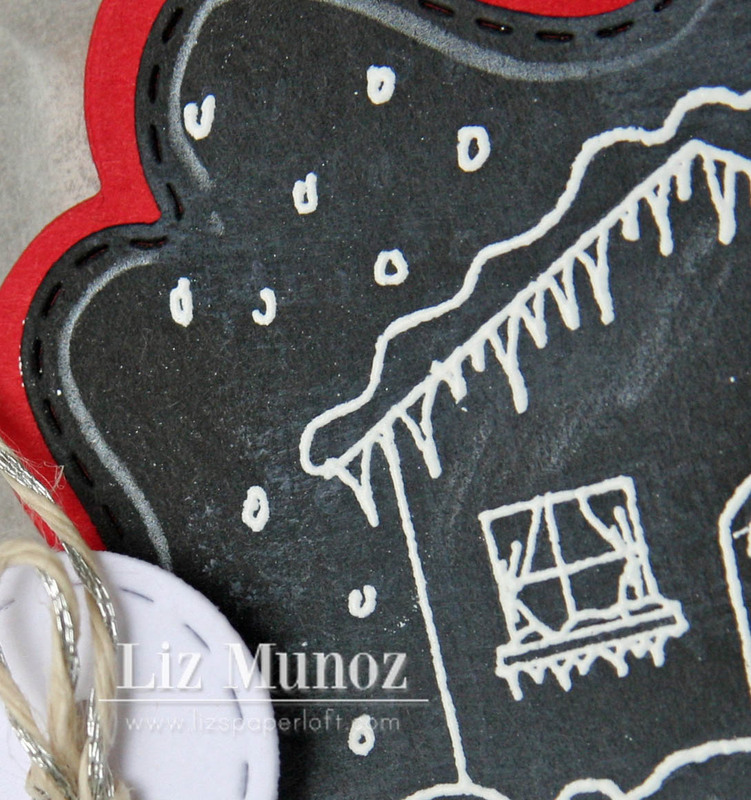 Liz's Paper Loft: My Creative Time's 12 Days of Christmas ~ Day 3! Hi crafty peeps! Welcome to My Creative Time's 12 Days of Christmas Day 3! I hope you've been enjoying what my design teammates have been sharing that past couple of days! I know, I have! Today I wanted to share with a fabbie treat bag that resembles chalkboard art! Chalkboard art is so hot right now! I've had a thing for chalkboards for along time. I'm not sure if it's the black and white thing or just that it's sort of "old timey"! Either way I love them, so when I came across a Betsy Veldman's blog showing this effect, I knew I had to do it! Because I need to make 50 of these treat bags, I wanted to keep them simple and the price down. So I used the stitched circle die from Build a Banner Kit to create a button! This video shows the step by step process for this awesome look! HI Love the chalt boad tag very nice. Wow!! 50 of them!! LOL You will be busy.. they are simple.. but not that simple.. still a lot of work goes in to one. I LOVE the chalkboard look! I bought some chalk board paint recently.. I wanted to figure out a way to use it! I think chalkboards are awesome!! Just gorgeous.. Love the die you are using too!! What a fun idea...and thanks for the video to show us how to replicate the chalkboard look. Very cool! Enjoyed the video and the project. I just LOVE how this turned out, Liz! And I am also amazed that you are making 50 of these - your definition of simple cracks me up! Everybody will LOVE them! Oh - I saw that tutorial too - and totally want to try it! LOVE blackboards too! This came out gorgeous! LOVE the finished effect!!! Great tags for your treat bags! TFS! What a GREAT project Liz!! LOVE the video and the fun technique!! I love that technique and your treat bag is adorable. Thank you for sharing how you made them. Great tutorial. 50 bags?? Really??? Whew! But I do love the chalkboard technique. Very cute idea. I like the chalkboard look--have fun making all of these. It looks so good! I love the chalkboard look, it gives it more of that hand made feel. And 50 of them Wow!! Great job! Love this Liz! The black board idea is fab, stealing it soon! Your friends will love to receive these! So cute! Love your gift bags...gonna have to try this technique! Love the XL label die...just purchased it myself recently! Liz your treat bag looks so cool! Im going to have to come back and check out your video, becasue I so want to try this chalk look out:) Thanks for sharing! This is so amazing! Thanks for the video too!! Thank You for showing how to do this chalk board technique. Your treat bags turned out beautiful. Great job! 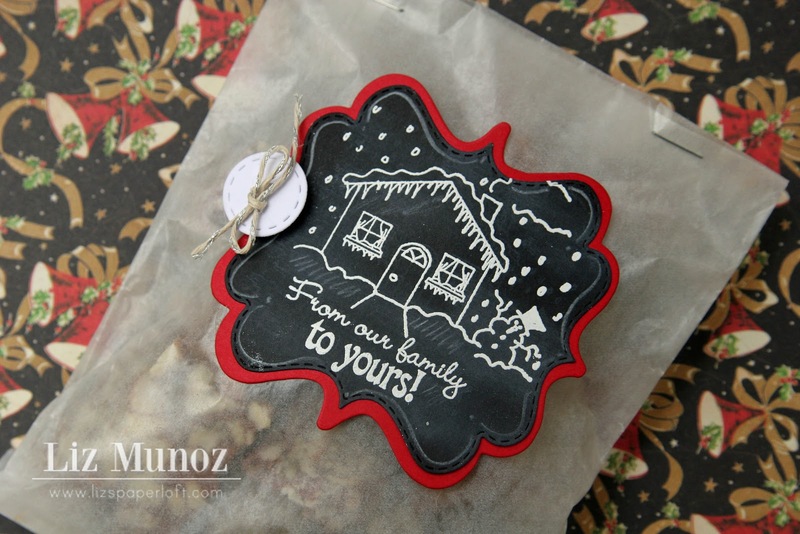 What a beautiful project; love the chalk-board look (must be the 'teacher' side of me coming out!). Thank you for sharing - and the video is BONUS! WOW this is beautiful Liz! I love how the image looks behind the black/chalk card stock! Great job! hugs! 50? Simple?? U must be smoking something! ha ha!!! girl I wish I had you drive! Great job! hugs! I am all about quick and easy projects! Love the chalkboard look with the red! Liz ~ OMG!! What a COOL but yet DRLING idea and look!!! I have never tried using chlkboard before or that neat pen but I want to know! LVOE the idea and ALWAYS LOVE your porducts!! I am also in AWE of making 50 ~ WOW! You go girl ~ FABULOUS & AWESOME job as always!!! Oops GREAT video too ~ LOVE watching them!! 50? Wow!! You go girl!! These are really cute!! Really cute treat bags. i like the chalkboard look. I will have to try your technique. It is beautiful. So cute! Love how it looks like a chalkboard. Very nice! Your work makes a plain bag so beautiful! Oh I do love this little treat bag! I thought that you had used real chalkboard paper!! Thanks so much for showing us how to make the faux chalkboard look, so cool and I can't wait to try it out! I love the white on black chalkboard affect. Thanks so much for sharing!! Nice bag. I am doing some bags and have lots of fun. Turned out great with the black and white chalk style. I just love black & white. So you know this is just lovely. What a neat little bag! That chalk effect is Fabulous!! Love the chalkboard what a fun idea. This is a super cute treat bag!! Watched your tutorial and I loved the chalk idea. Thank you so much for sharing.